This morning there was a snapping turtle at the side of the road in the park, facing across. I thought perhaps it’s a female going to lay eggs, this is the time for that. It’s been a couple of years since I picked up a snapper and as I was reluctant to try that today I found a long stick for her to latch onto so I could drag her across. But she wouldn’t latch onto it. I danced it front of her face, I tapped her toes and her back, she would not bite. She seemed somnolent. I left her be. I hope she will make it across. LATER- Dennis went and looked this afternoon. No smashed turtle in the road so she probably made it to where she was headed-sometimes things just work out. 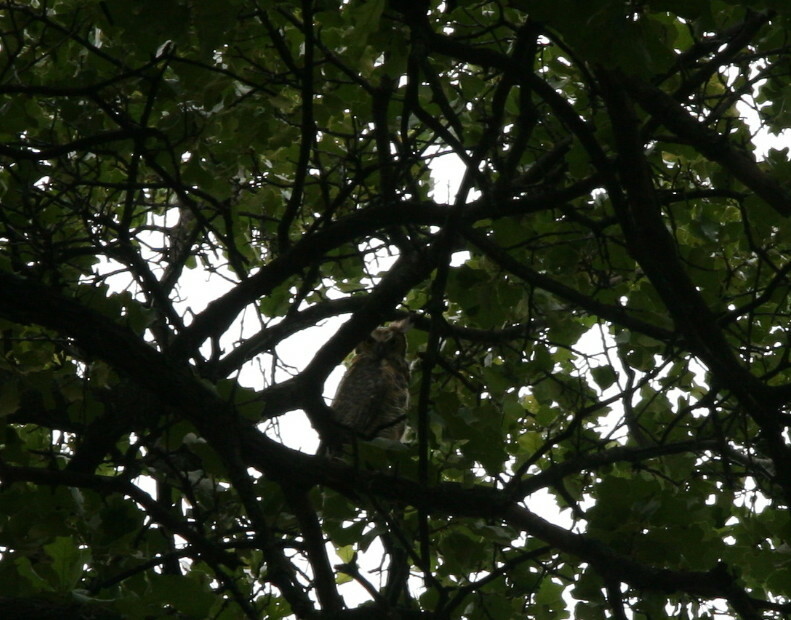 Also today, this young great horned owl was in the blackjack oak in our neighbor’s front yard and the crows were making a ruckus trying to chase him/her off. Likely the spawn of the owls we’ve been hearing since late winter.